Miralax is one of the most commonly prescribed medications for toddlers and children, even though it is not FDA approved for children under 17. It also is only intended to be used short-term (the label indicates no more than 7 days at a time), but I see many children in my practice that have been on it for YEARS! That being said, nearly all of my clients with chronic constipation come into my practice on Miralax, since this is the only solution their pediatrician and/or gastroenterologist gave them. Are you ready for a shocking fact? 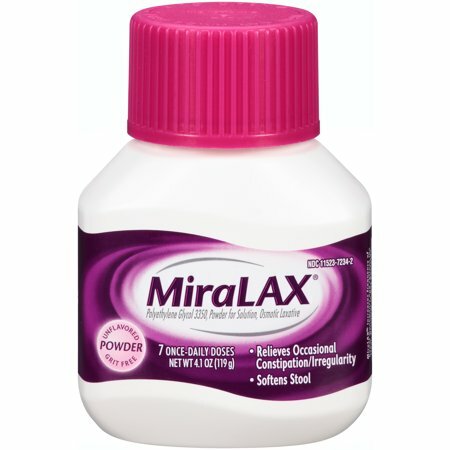 Miralax actually does nothing to treat constipation. The active ingredient, polyethylene glycol, causes a rapid influx of water into the gastrointestinal tract, causing anything in the gut to be “flushed out”. This is called osmotic diarrhea (you’ll see that Miralax states on the label that it is an osmotic laxative). Having chronic osmotic diarrhea can lead to many other issues like dehydration, imbalance of electrolytes, dysbiosis, and damage to the lining of the gut. Think of Miralax as a bandaid - doing nothing to actually treat the root cause, but just masking symptoms of the actual issue. For example, let’s say that your child really has an underlying yeast overgrowth that is causing chronic GI issues and constipation, will a rapid flush of water/bowel movement do anything to treat this? No. Will changing diet and using supplements targeted to yeast help treat the overgrowth (the root cause), therefore helping the chronic constipation? You bet. Natural Calm is a great place to start. They have an adult and children’s version. The Kid’s product is best for children under 6, and we can start the adult product for older children. The American Heart Association recommends that children ages 6 to 17 years of age get at least 60 minutes of moderate-to-vigorous-intensity aerobic each day.